Allies were aware of these camps. They learned what was going on in these camps only at the end of the war. Dwight Eisenhower described it as: “ Ruthless. 2 Allies were aware of these camps. They learned what was going on in these camps only at the end of the war. Dwight Eisenhower described it as: “ Ruthless disregard with every sense of decency.” along with inhumane. Camps were liberated almost immediately. 3 Axis Powers are charged with war crimes. 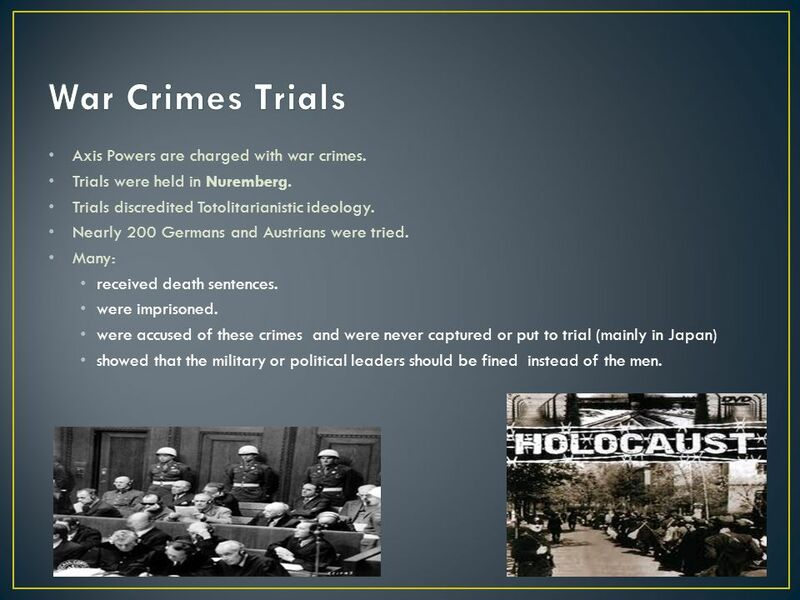 Trials were held in Nuremberg. Trials discredited Totolitarianistic ideology. Nearly 200 Germans and Austrians were tried. Many: received death sentences. were imprisoned. were accused of these crimes and were never captured or put to trial (mainly in Japan) showed that the military or political leaders should be fined instead of the men. 4 War crimes discredited totalitarian ideology. 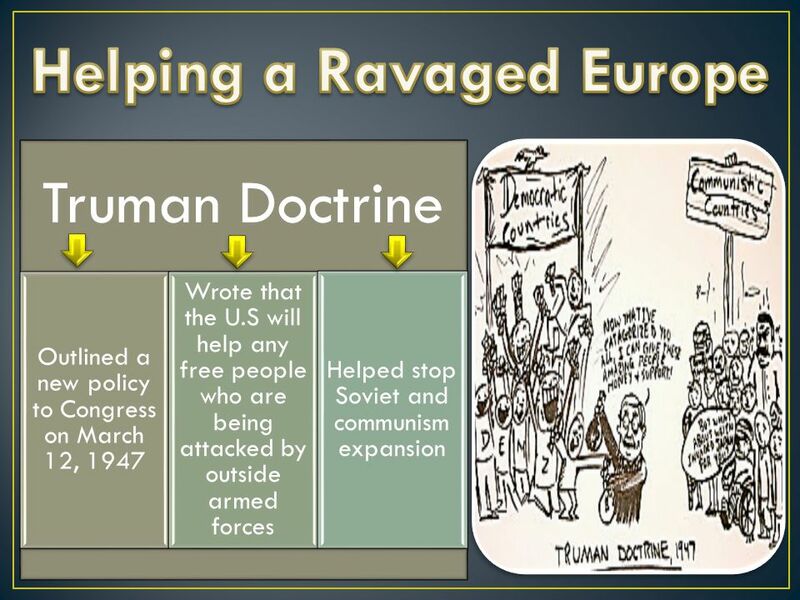 US tried to ensure peace in Europe. 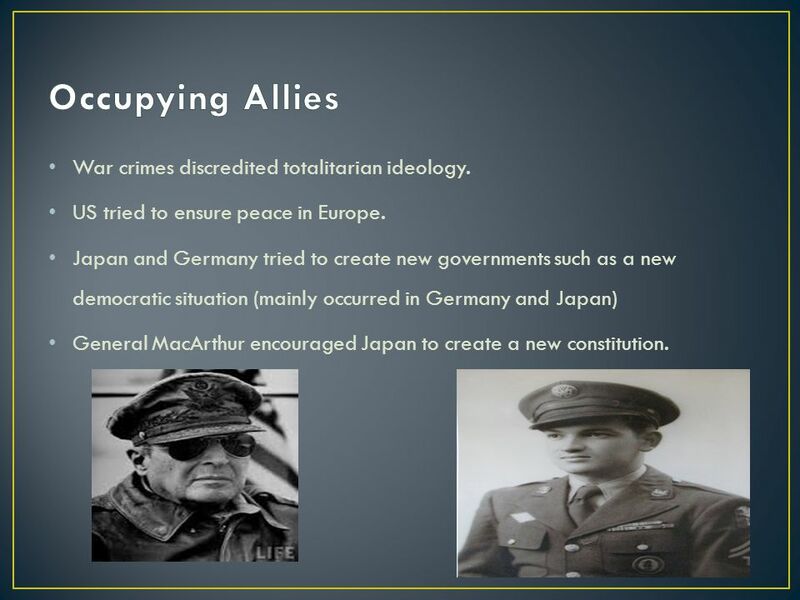 Japan and Germany tried to create new governments such as a new democratic situation (mainly occurred in Germany and Japan) General MacArthur encouraged Japan to create a new constitution. 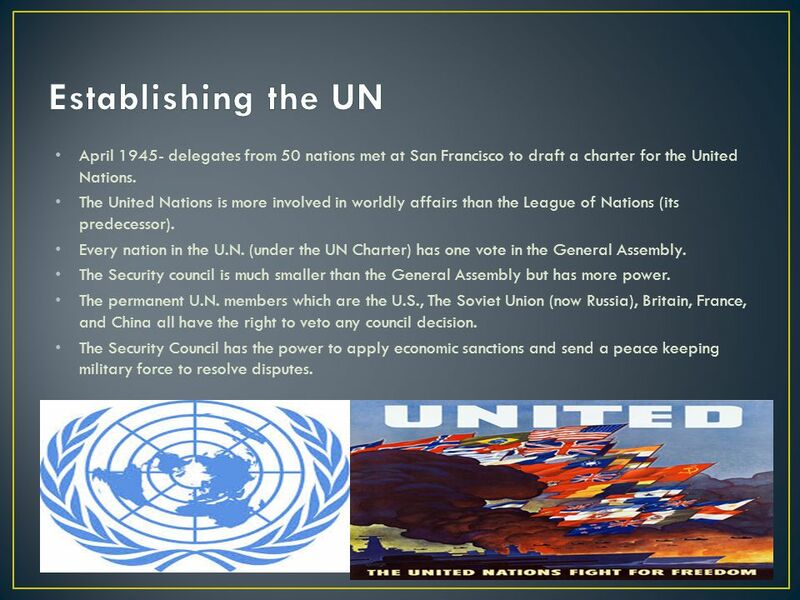 5 April 1945- delegates from 50 nations met at San Francisco to draft a charter for the United Nations. The United Nations is more involved in worldly affairs than the League of Nations (its predecessor). Every nation in the U.N. (under the UN Charter) has one vote in the General Assembly. The Security council is much smaller than the General Assembly but has more power. The permanent U.N. members which are the U.S., The Soviet Union (now Russia), Britain, France, and China all have the right to veto any council decision. The Security Council has the power to apply economic sanctions and send a peace keeping military force to resolve disputes. 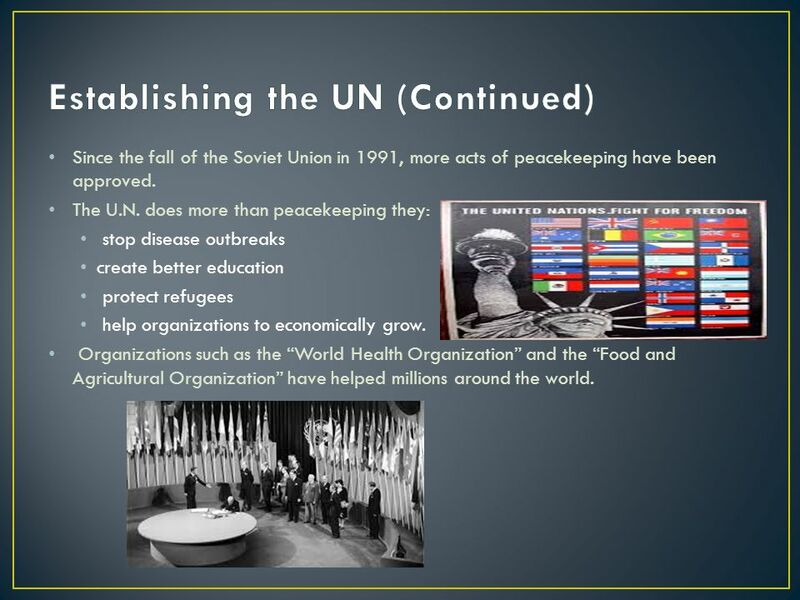 6 Since the fall of the Soviet Union in 1991, more acts of peacekeeping have been approved. The U.N. does more than peacekeeping they: stop disease outbreaks create better education protect refugees help organizations to economically grow. Organizations such as the “World Health Organization” and the “Food and Agricultural Organization” have helped millions around the world. 12 "Allied-occupied Germany." Wikipedia. Wikimedia Foundation, 18 May 2014. Web. 20 May 2014. "Flags Associated with the Cold War 1946 to 1992." ZFC -. Web. 20 May 2014. "The Holocaust | Publish with Glogster!" Glogster. Web. 20 May 2014. "Internet Wereldwijd Gemonitord - Ergens in NL." Ergens in NL. Web. 20 May 2014. 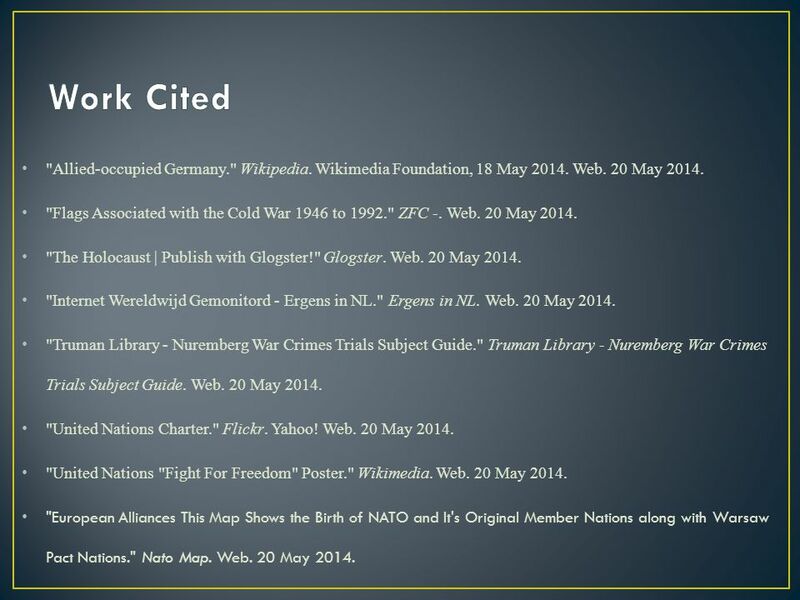 "Truman Library - Nuremberg War Crimes Trials Subject Guide." 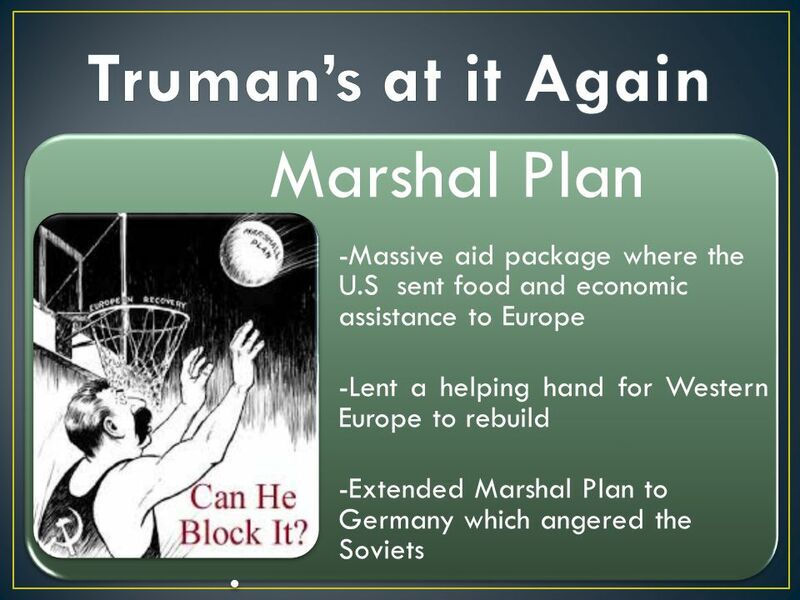 Truman Library - Nuremberg War Crimes Trials Subject Guide. Web. 20 May 2014. "United Nations Charter." Flickr. Yahoo! Web. 20 May 2014. "United Nations "Fight For Freedom" Poster." Wikimedia. Web. 20 May 2014. "European Alliances This Map Shows the Birth of NATO and It's Original Member Nations along with Warsaw Pact Nations." Nato Map. Web. 20 May 2014. 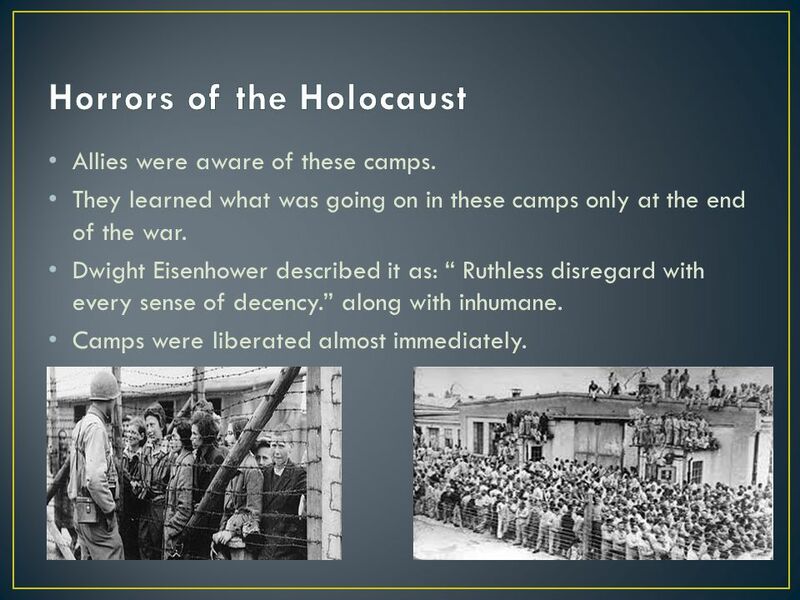 Download ppt "Allies were aware of these camps. They learned what was going on in these camps only at the end of the war. Dwight Eisenhower described it as: “ Ruthless." 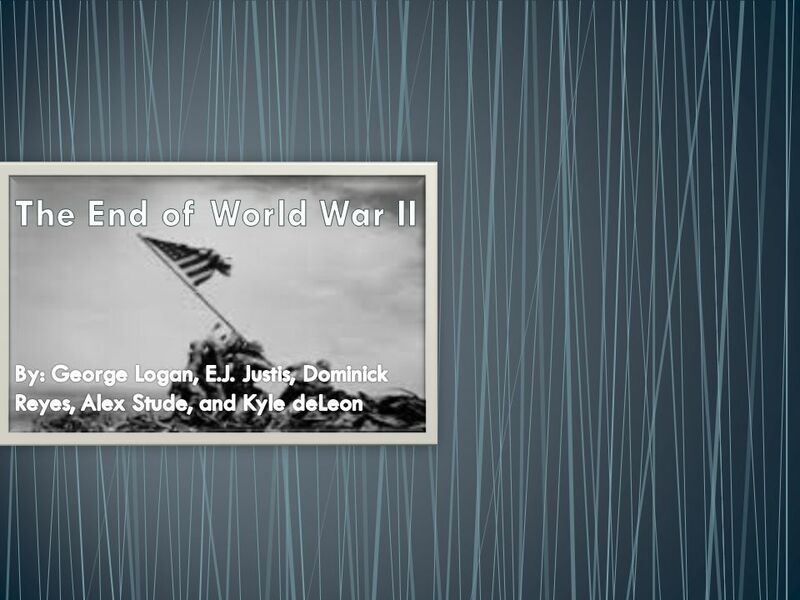 THE END OF WORLD WAR II OK, NOW WHAT!. Objectives Describe the issues faced by the Allies after World War II ended. Summarize the organization of the. 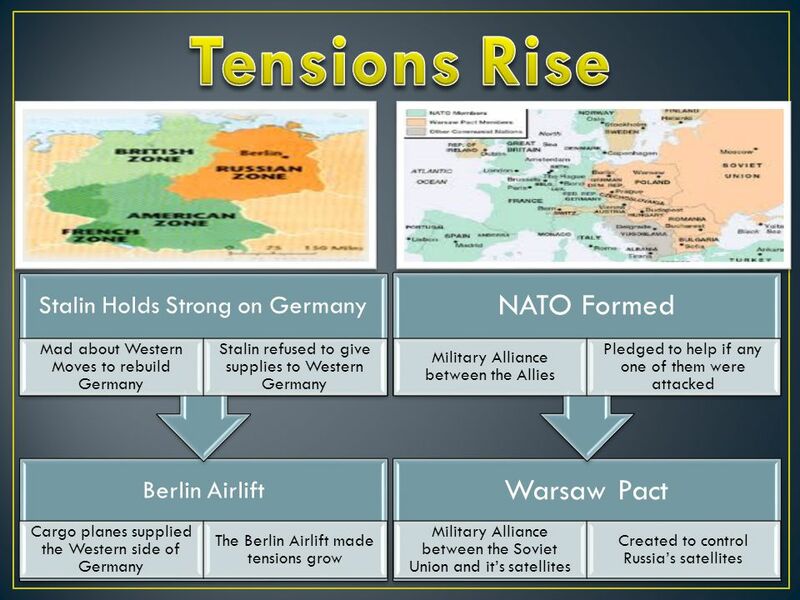 From World War to Cold War By: Allison Sheets Adapted from a presentation by Alli Sheets 2012. The End of World War II Chapter 14 Section 5. Costs of World War II While the Allies enjoyed their victory, the huge costs of WWII began to emerge As. 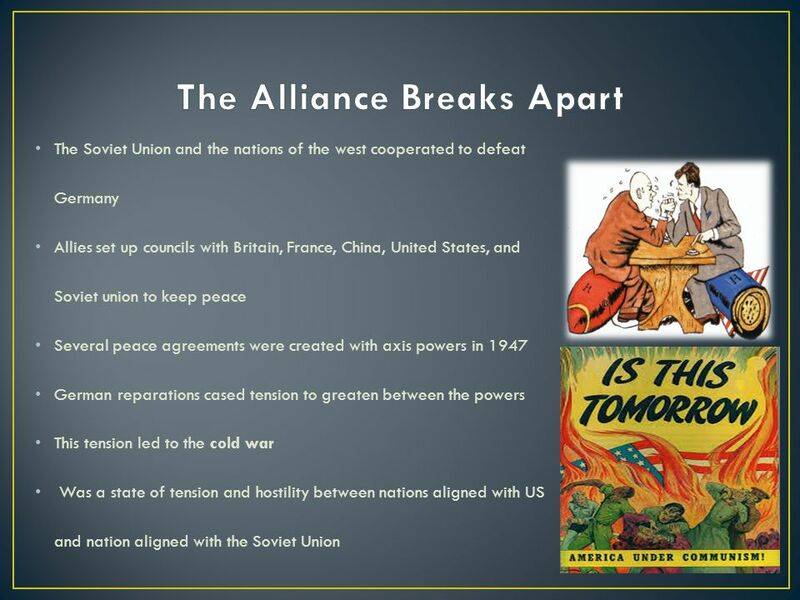 18.1 Critical Thinking What caused suspicions between the US and Soviet Union during WWII? 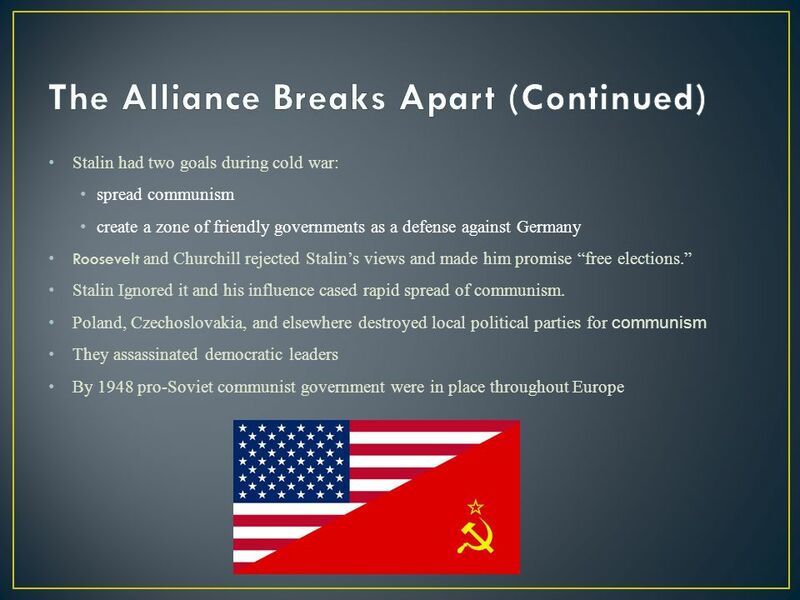 Stalin had once been an ally of Hitler and only changed sides. TEKS 8C: Calculate percent composition and empirical and molecular formulas. Aftermath of World War II. The Cold War Spring The Cold War Was called “Cold War” in reference to the chilly relationship between the US and the USSR. “Cold War” as opposed. Cold War Begins Post-WWII Notes US Goals Provide democracy and promote economic opportunity Provide democracy and promote economic opportunity –Serves.